Groundwater is one of the Earth’s most precious resources. We use it for drinking, bathing, and many other purposes. Without clean water, humans would cease to exist. Unfortunately, because of ignorance or lack of caring, groundwater is often contaminated through industrialization, industry, construction or any number of other ways. It is the job of the environmental engineer to remediate the contaminated groundwater and make what has been tainted safe again.Selecting the proper remediation strategy and process is the key to moving forward, and, once this process has been selected, it must be executed properly, taking into consideration the costs, the type of contaminants that are involved, time frames, and many other factors. This volume provides a broad overview of the current and most widely applied remedial strategies. Instead of discussing these strategies in a generic way, the volume is organized by focusing on major contaminants that are of prime focus to industry and municipal water suppliers. The specific technologies that are applicable to the chemical contaminants discussed in different chapters are presented, but then cross-referenced to other chemical classes or contaminants that are also candidates for the technologies. The reader will also find extensive cost guidance in this volume to assist in developing preliminary cost estimates for capital equipment and operations & maintenance costs, which should be useful in screening strategies. The eight chapters cover all of the major various types of contaminants and their industrial applications, providing a valuable context to each scenario of contamination. 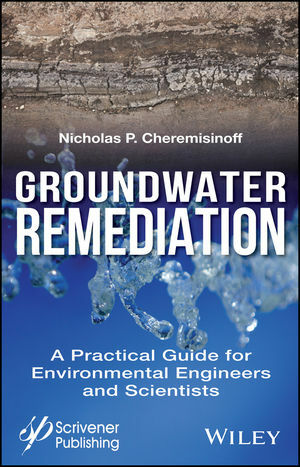 This is the most thorough and up-to-date volume available on this important subject, and it is a must-have for any environmental engineer or scientist working in groundwater remediation. Nicholas P. Cheremisinoff is a chemical engineer with more than 40 years of industry, R&D and international business experience. He has worked extensively in the environmental management and pollution prevention fields, while also representing and consulting for private sector companies on new technologies for power generation, clean fuels and advanced water treatment technologies. He is a principal of No Pollution Enterprises. He has led and implemented various technical assignments in parts of Russia, eastern Ukraine, the Balkans, South Korea, in parts of the Middle East, Nigeria, and other regions of the world for such organizations as the U.S. Agency for International Development, the U.S. Trade & Development Agency, the World Bank Organization, and the private sector. Over his career he has served as a standard of care industry expert on a number of litigation matters. As a contributor to the industrial press, he has authored, co-authored or edited more than 160 technical reference books concerning chemical engineering technologies and industry practices aimed at sound environmental management, safe work practices and public protection from harmful chemicals. He is cited in U.S. Congressional records concerning emerging environmental legislations, and is a graduate of Clarkson University (formally Clarkson College of Technology) where all three of his degrees - BSc, MSc, and Ph.D. were conferred.